Q. What is included in my entry fee? Q. How far and how high? Q. Is there a limit on registration? We have set a limit of 500 riders total for all rides this year. Q. Will day of event registration be allowed? We will allow riders to sign up on the day of the event (assuming we’re not sold out), but you will not be guaranteed a t-shirt, and we could run short of goody bags, etc. A $10 extra charge will be added to onsite registration either the day of the event or the day before the event. Q. Can I camp overnight or stay in may car overnight at Mendocino College? Mendocino College has a gate they close at night. They will roust you if you are trying to stay overnight on their property. You can legally camp at Lake Mendocino which is only a few miles away. Q. What is the event schedule? Q. Is the event timed? Q. What are the routes like? All registrations are final and non-refundable. Q. Who is this ride for? For professional cyclists, this is an opportunity to stretch your legs in a relaxed environment. This is a challenging ride that will test your skills in a friendly way, with support and companionship along the entire route. For recreational cyclists, this is your chance to ride along a route that is amazingly beautiful and definitely challenging. Along the way, you will find great food, great support and friendly faces. Q. Is there a minimum or maximum age limit? But all participants must be aware of their individual limitations. It is expected that all riders will have trained properly for the distances and climbs involved for the route they have chosen. Q. Will you pick up our clothing at rest stops and bring it back to the finish? We will allow riders to put their clothing in bags with their rider number at each rest stop, and then we will shuttle the clothing back to Mendocino College for the finish. Q. What are the roads like – what tires should I use? Although we have the advantage of lightly travelled rural roads, we also have the disadvantage of poorly maintained rural roads. The road surface varies from smooth asphalt in some places to crumbly chuck-holed asphalt in others. The road is paved throughout the course and never degenerates to dirt or gravel, but it does get fairly rough at times. If you have the ability to choose your ride, you'd benefit from a frame and tires that can handle some rattling. Q. What are the details on the barbecue? The barbecue will be held at Mendocino College. It will be outdoors in ‘The Grove’ which is in a wooded area just to the east of the main parking lot. We are planning to start serving around 1:00 PM and stop serving around 6:00 PM. Q. Will you serve beer or wine? A. We are planning to have beer available at the barbecue at the end of the ride. Q. Do all the routes start and finish at the same location? Q. Where the heck is Ukiah? 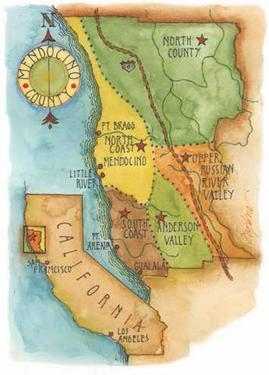 Ukiah is in Mendocino County in northern California. We are just 2 hours from San Francisco, 2.5 hours from Sacramento and 7 hours from Los Angeles. Ukiah is closer than you think.